Created in partnership between Tū Ora Compass Health and the Porirua Youth 2 Work Movement the cadetship offers a 9-month work experience and study combination. 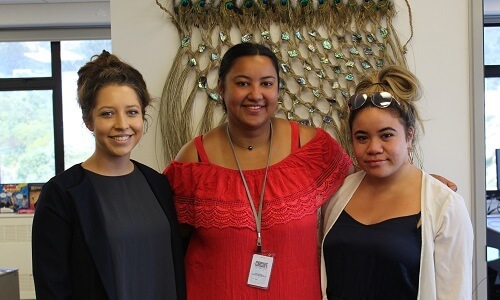 Michelle Robinson, Executive Director for Partners Porirua, which leads the Youth 2 Work Movement, says the two young women taking part in the cadetship will come out the other end with invaluable work experience in the health sector and a Level 3 Certificate in Youth Development. “This will be a real leg up for them to enter into further study or employment in health and youth related fields. Ms Robinson say this cadetship is a test case with the view to expanding the programme into other sectors working with different types of employers. Tū Ora Compass Health and Partners Porirua took the cadetship opportunity to Porirua JOBfest 2018. They received 19 applications, shortlisted, interviewed and offered the roles to Sieni Thetadig and Hineora Mike who started in October 2018 and will finish in June 2019. As a young parent Hineora had struggled to find a job that was flexible enough to accommodate the hours she needed to work to be there for her son. After leaving school early Hineora had joined the teen parent unit to obtain some qualifications but left just shy of completing Level 3. Hineora is planning to undertake a degree in youth development once her cadetship finishes. For Sieni the cadetship was a bit of a dream come true, she’d struggled to find a job after leaving school and was applying for anything and everything. She found out about the Youth Health Ambassador role and really liked the sound of it. Sieni is loving being a part of a team contributing to different projects and then getting out into the community to see the health programmes in action. Ranei Wineera-Parai is the Maori Population Health Team Leader at Tū Ora Compass Health. As a partner of the Youth 2 Work Movement she’d been exploring ideas with the team on what they could offer to young people. “Within Tū Ora Compass Health we have a lot of very experienced, mature workers. Because we do provide youth services, we felt that the youth voice was missing and that we’d really benefit from having some young people around contributing to our projects and providing advice. Sometimes they don’t even realise that when they’re having conversations, they’re providing us with advice and information we wouldn’t have otherwise – we can really see the value in having them around. Ranei says the cadetship is a great partnership with Partners Porirua. Photo caption (above): Hineora and Sieni with their workplace mentor Ariana Rangi (left).